Maybe there aren’t too many. I don’t know. But it sure felt like I had a bunch of repairs to make! Knowing how much some of you love seeing me fix things, though, I kept the footage to post. Enjoy! Watch the video below or click HERE to see it in HD on YouTube. Fun card Sandy, do love the penguins that you have used this week. Thank you for inspiring me so much this week towards some Christmas images. I’ve really enjoyed penguin week (and videos). 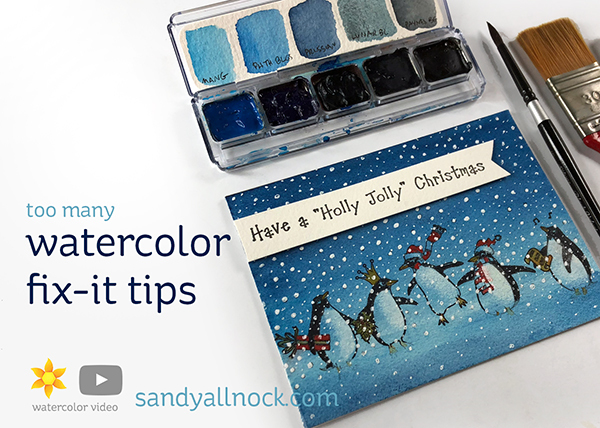 I didn’t catch many mistakes—those of us who use watercolor make boo-boos with every project—but as my art buddy reminds me: there are no mistakes in art! Love the snow storm they are playing in. Looks like FUN! 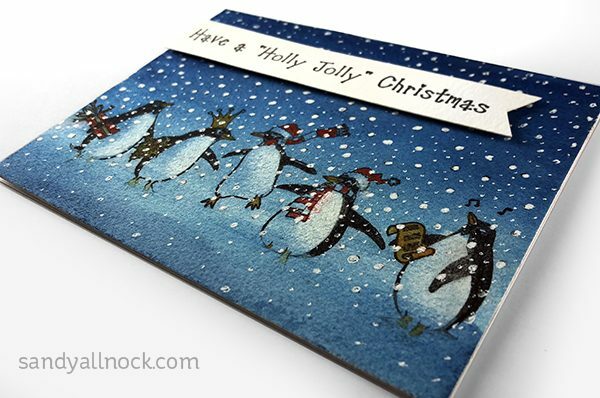 What a happy card, love those pinguines dancing in the snow. Thanks Sandy for a cute and lovely card and all the tips. Have a nice weekend. Thank you so much. It is so helpful when everything isn’t perfect, thanks for sharing those tips with us. Love that you keep it real when “fixes” are needed. But the end product doesn’t tell! The penguins are adorable. I’m really enjoying Penguin Week, and this entry has a lot of the kinds of tips I always need – thank you! Fun! I will definitely need to go through my stash to dig up a few penguins to play with. Thanks for the inspiration, Sandy, as always.